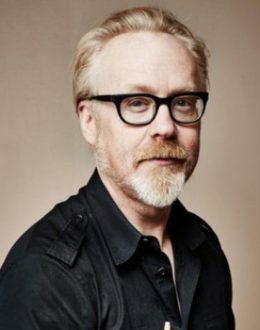 Adam Savage was born in New York City in the summer of 1967. The child of a psychotherapist and a filmmaker/painter, raised north of the city in Sleepy Hollow, he showed an early penchant for science classes, art classes, the drama club, and elaborate school pranks—though not necessarily attended to in that order. His young adult years took him back in New York City, working variously as a projectionist, photo developer, graphic designer, assistant animator, set designer, gallery owner, actor, sculptor, and prop-maker. In the summer of 1990, he turned west to San Francisco and fell into its thriving theater scene, working for dozens of companies as a set designer, prop maker, art director, scenic painter, rigger, master carpenter and producer. In Northern California’s hub of the machine art community Adam’s skill arsenal grew—he welded, fooled with pneumatics, hydraulics, electronics, and picked up some rudimentary machining techniques at Amorphic Robot Works, building robotic animals, music-playing robots, climbing robots—even a robotic opera. During these years he was also sculpting and exhibiting his sculpture in 50-plus solo and group shows around the country. This quirky mix of artistic, theater-design and mechanical skills left Adam with a reputation for solving difficult mechanical set problems for theaters. And that eventually caught the eye of the special effects industry. Starting in commercials, he built and rigged props and set pieces for over 150 commercials, with clients as diverse as Sega, Coca-Cola, Nike, Burger King and Chevrolet. He built the props for and art-directed a Coca-Cola commercial which was then nominated for a Clio award. He left special effects for 18 months to head R&D for a small startup toy company, ZOOB—creators of ZOOB, the building toy. There he oversaw product development, merchandising and package design, as well as trade-show design and implementation. From the toy world he moved again toward special effects—this time to George Lucas’ Industrial Light and Magic, where we worked on Star Wars, Episodes 1 and 2, Galaxy Quest, Space Cowboys, A.I., Terminator 3, The Mummy, and over a dozen commercials. Between stints at ILM he worked in the prop department for Disney on Bicentennial Man, and as a model-shop supervisor on the two Matrix sequels. During this time he also taught Advanced Model-making and Problem Solving for five semesters at the Academy of Art College in San Francisco. In the spring of 2002, his old boss Jamie Hyneman called Adam to ask if he’d like to participate in a demo reel for a TV pilot—a new show for the Discovery Channel called Mythbusters. The show aired in January of 2003 with Adam and Jamie as its hosts. It was picked up by Discovery three weeks later. Twelve years later, it remains one of the network’s highest rated shows. Mythbusters’ 160-and-counting episode hours have tackled over 750 myths and performed nearly 2,500 experiments. Adam and Jamie travel the country to corporate events, museums, and colleges, for groups as small as 20 and as large as 20,000, telling tales of experiments, explosions and hijinks. Adam has multiple hobbies and is passionate about restoring his vintage four-wheel drive vehicle, and researching and accruing new pieces for his movie prop collection. But his true love is his family. He lives with his wife, twin boys, and their two amazing dogs. To enquire about a particular speaker(s) for your event please fill in the form below and we will get back to you immediately.